For the growth hormone system, the pituitary modifies the hypothalamic output and any exogenously applied stimulation with hormone releasing peptides to such an extent that, if the authors wish to infer the output of the hypothalamus from the observed profile of GH in the circulation, then as a first step they must establish a mathematical model that adequately reflects the behavior of the pituitary. A preliminary model has been based (13) on the Law of Mass Action applied to reversible binding of GRF and/or secretagogue to its receptors (Fig. 1). For the present the general discussion will be phrased just in terms of GRF. 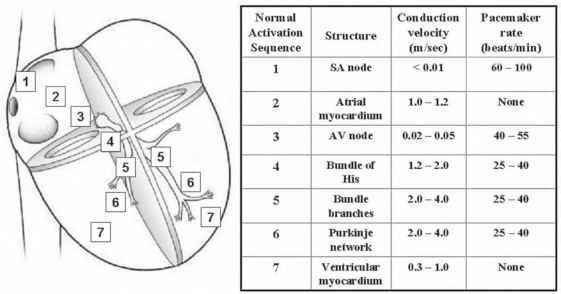 However, in general, analogous arguments hold for the actions of GHRP and other artificial secretagogues at the pituitary when these are applied in isolation, so the following model framework can be extended naturally to encompass these additional factors. How to model the pituitary response to simultaneous application of GRF and artificial secretagogues is beyond the scope of this chapter. Fig. 1. A schematic form of the model. transduction pathway, reducing the intracellular concentration of cAMP, and also induces hyperpolarization by increasing potassium conductance. 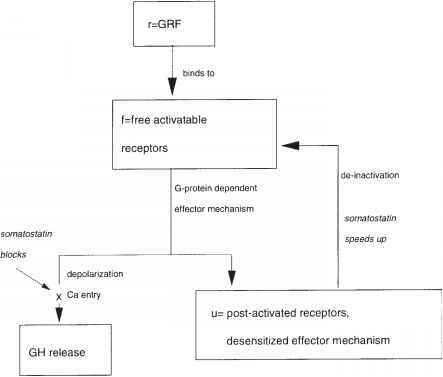 Therefore, in the authors' model, the release rate of growth hormone is directly proportional to the rate of binding of GRF, but inversely proportional to the concentration of SRIF, resulting in pulses of growth hormone in the absence of SRIF and much smaller pulses in its presence. The model assumes proportionality between receptor binding and the release signal, which is probably a function of localized intracellular calcium concentration arising from calcium entry via L-type channels, which are modulated by second messenger pathways.